any other piraty sayings ? You need to do the accent for the full effect. Why do they call them pirates???? Sharkbait Gold Ned Head,, hmm , I like it! 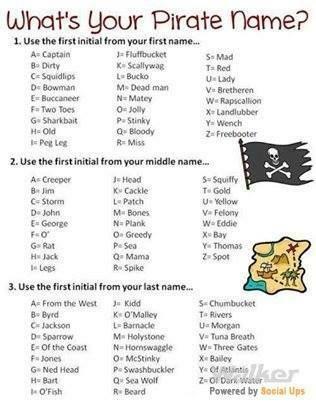 Baccaneer Captain Byrd, :pirat: Eye, Captain! did monty python ever do a pirate sketch? Rapscallion Sea Jackson, reportin' for duty! No seaman jokes please. I don't want to soil my blouse. Arr now I be rezentin' that young RRRossko! If anyone be deservin' the name Ned Head tis I, Cap'n Sharkbait !! Well I be.......Stinky Jack Of the Coast!